14ft Enclosure for Waouuh 430 trampoline. Premium enclosure for your Waouuh 430. This enclosure will allow you to make your trampoline a safe area to play on. 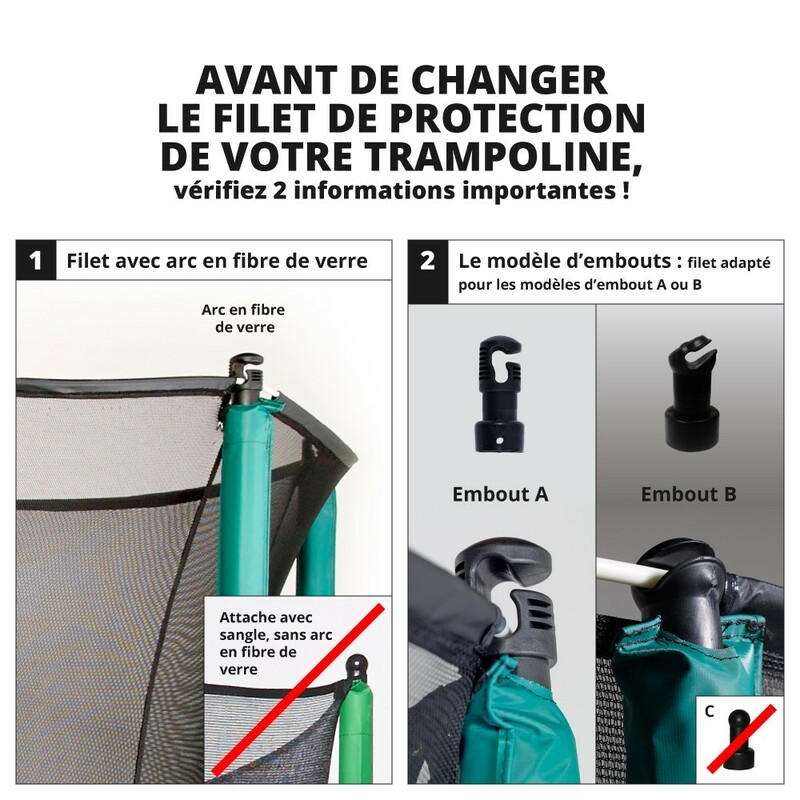 It will prevent users, children as well as adults, from falling off the trampoline when they jump. This trampoline is adapted to Waouuh trampolines of 4.30 m in diameter. - This enclosure has a very resistant double entrance which is specific to France Trampoline. 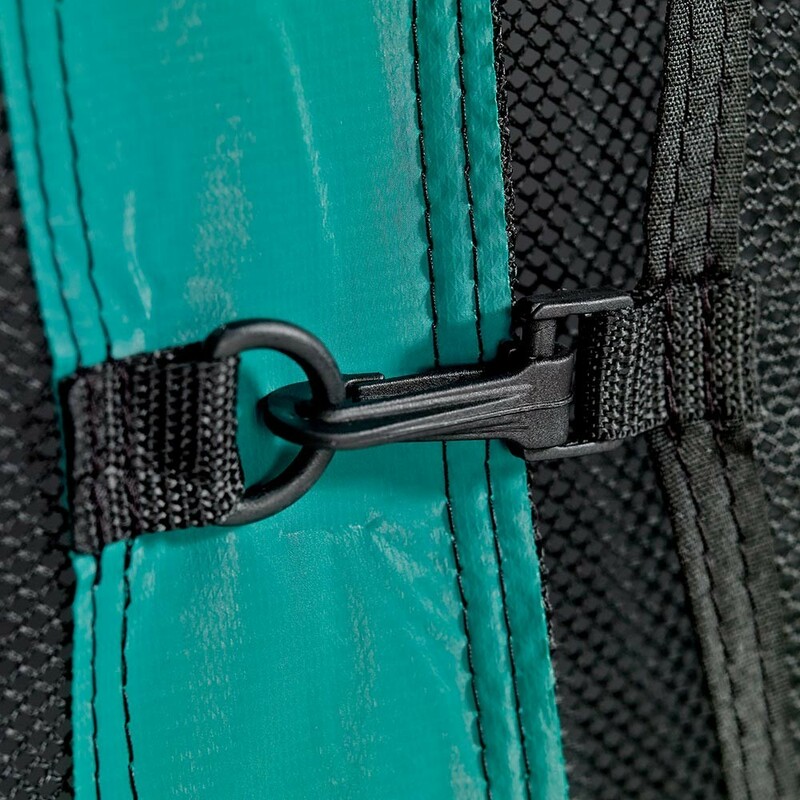 Thanks to its Velcro strips and its clips, the door is reinforced for safe and secure entry and exit. 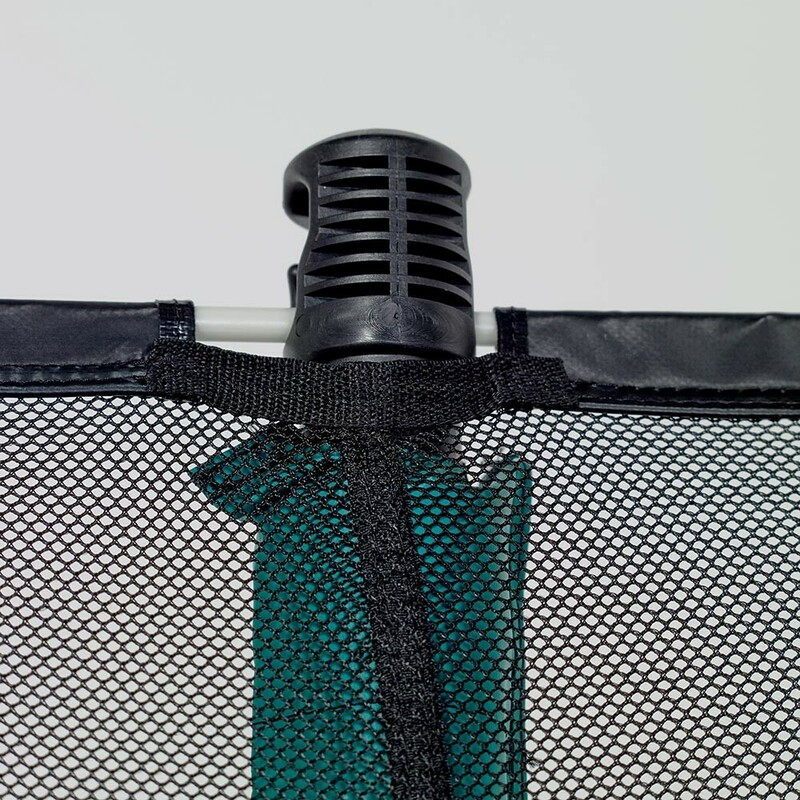 - The netting is very fine and tight in order to prevent your children from getting their fingers stuck in the net. 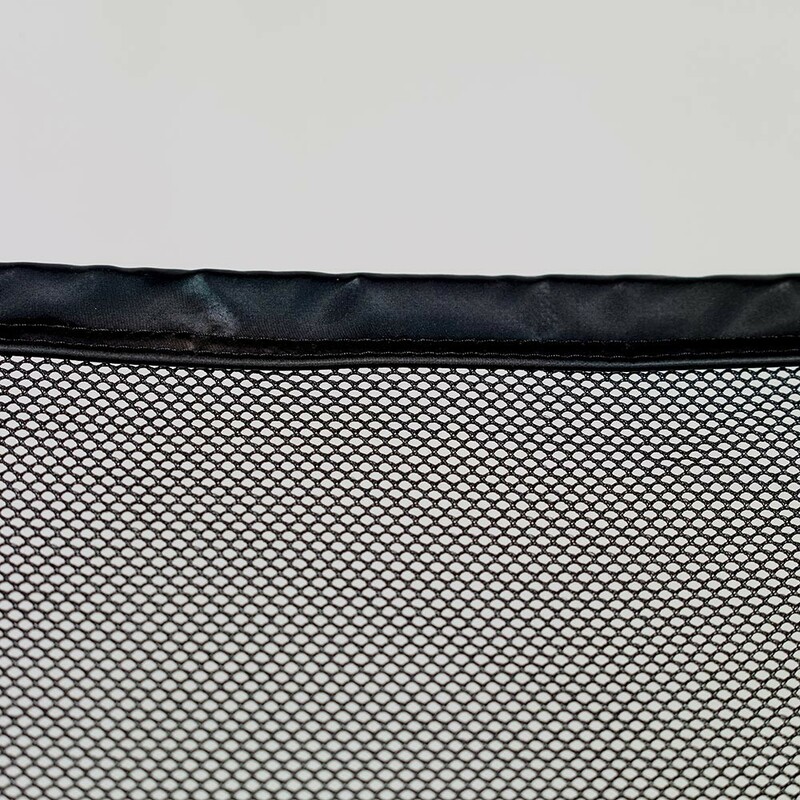 The double-layered netting also makes it more resistant. 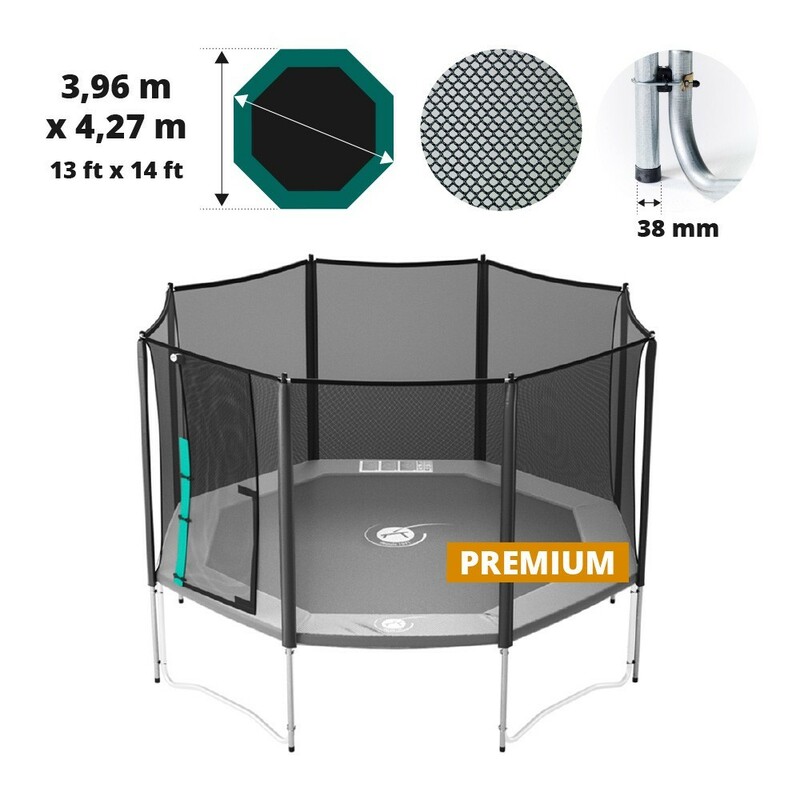 - The enclosure is fixed under the trampoline which prevent users from slipping between the enclosure and frame pad and injuring themselves. - The structure of the enclosure is made up of 8 posts. Each of the posts are 38 mm in diameter and are made of hot-dip galvanized steel, which protects them from corrosion over time. 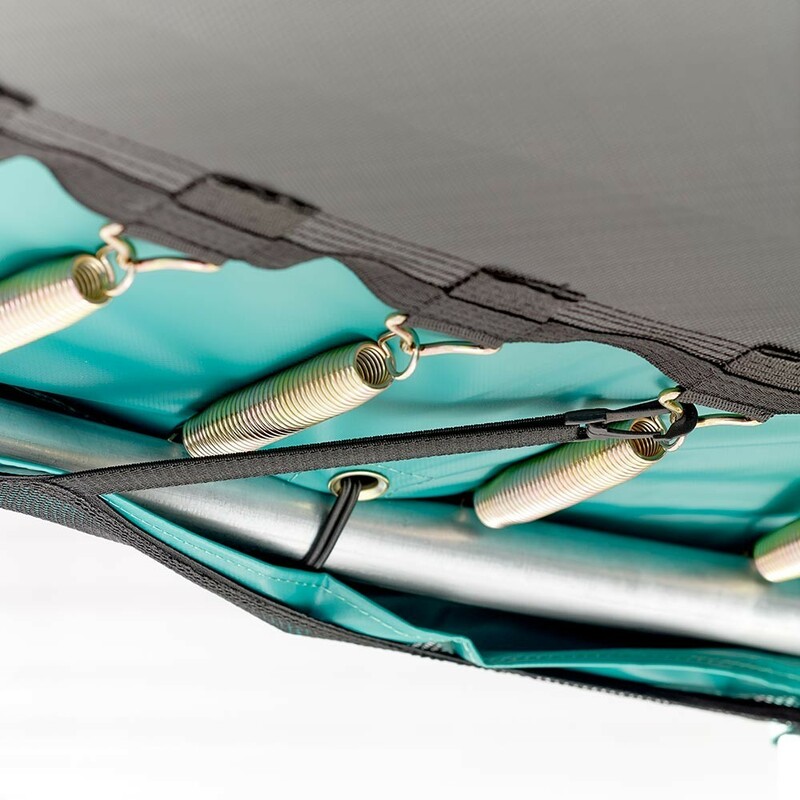 As they go all the way down to the ground alongside the legs of the trampoline, they add stability to the structure. Two fixation points strengthen the framework and the posts are fixed to the enclosure using brackets. 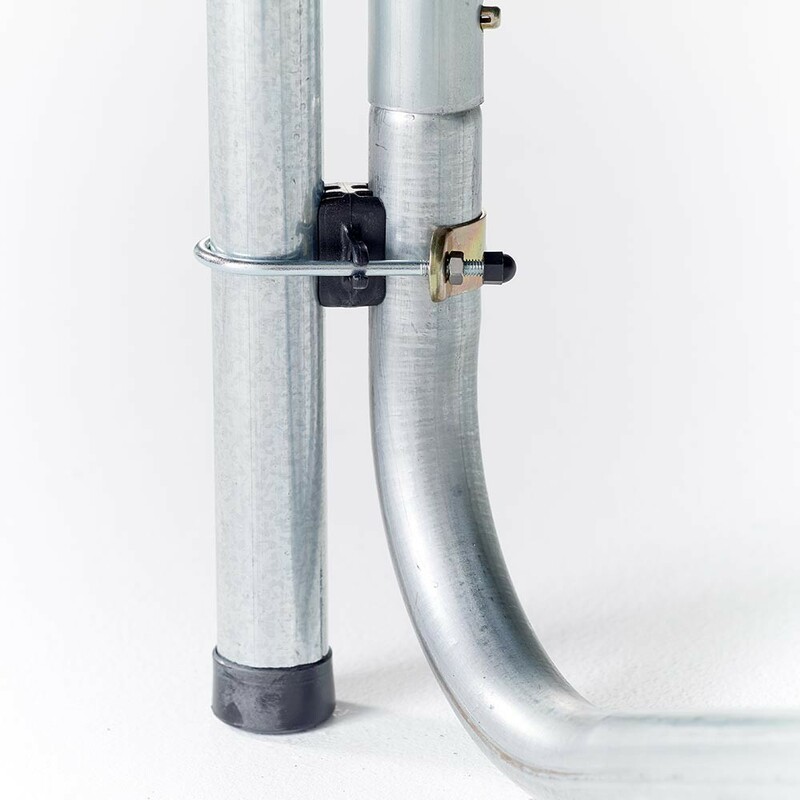 - This system means that it is unnecessary to drill into the posts and this way, the galvanization is not damaged. 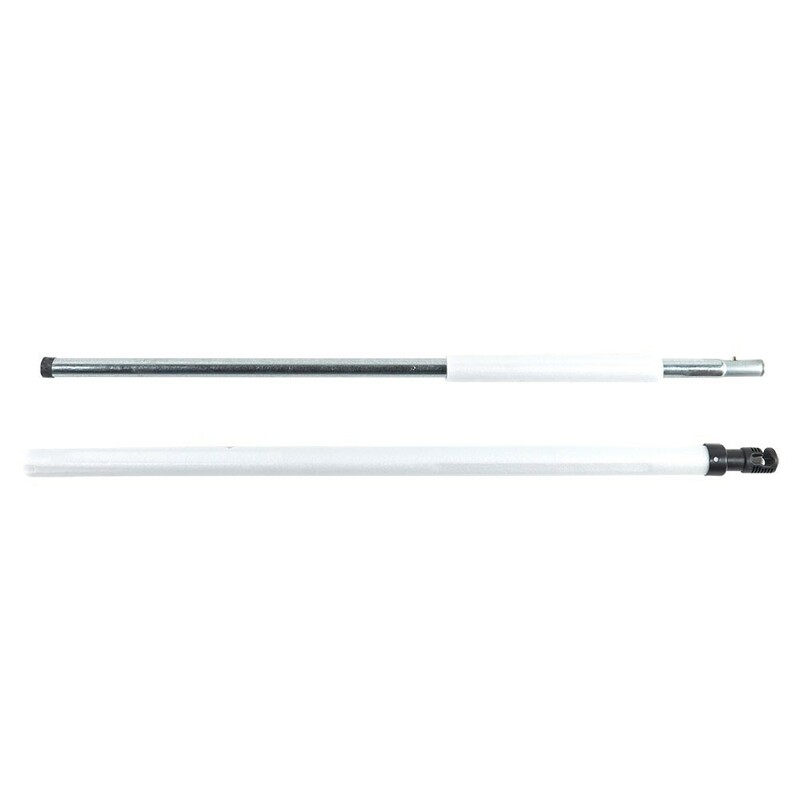 - A shock-resistant, PVC-covered foam covers the posts which protects them from UV light. - Fibreglass rods have been used at the top of the enclosure guaranteeing that the net is permanently and tightly held in place. 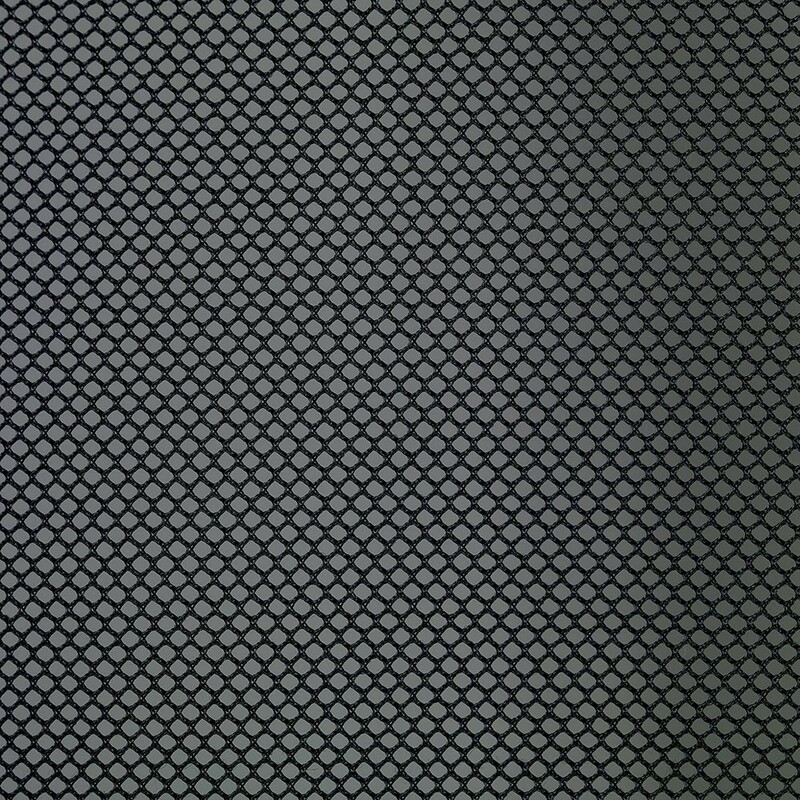 When the net is tightly stretched it is more shock-resistant. Furthermore, it will look more aesthetic then a loose net. 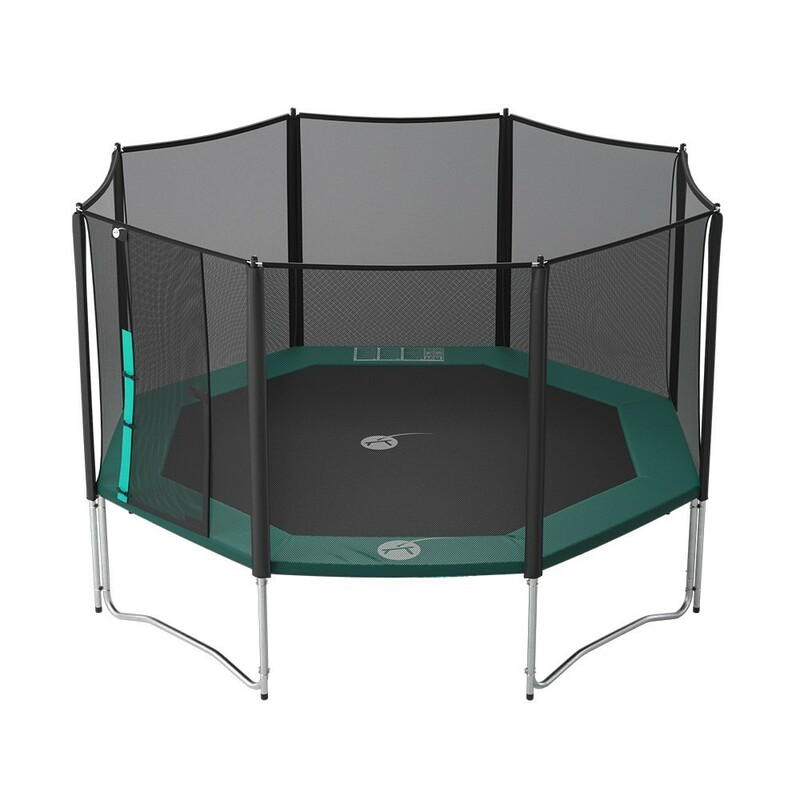 The Waouuh 430 enclosure is adapted to the Waouuh 430 trampoline and all other trampolines with 4 feet measuring 4.27 x 3.96 m in diameter.